Regardless of what you think about abortion or Planned Parenthood, this counter-punch by P.P. against its attackers rings of certain truths about America’s idol worship of Israel. The truth is that Israel is a “socialist” country, if your idea of a socialist country is a country that provides 100 percent, government-funded health insurance to its citizens. But American conservatives so adamantly opposed to universal health care have no problem with that because–it’s ISRAEL. And Israel can do no wrong. 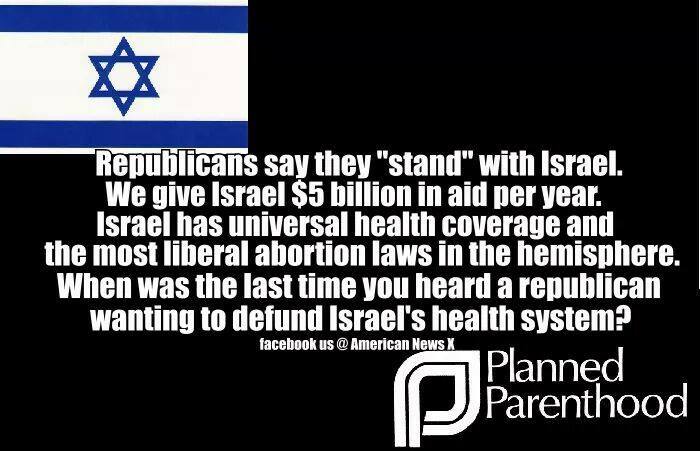 But then there’s Israel’s liberal abortion laws. You would think that American conservatives, who give billions in aid to Israel without a single string attached, would be vocal in opposing Israel’s pro-abortion law. Yet you’ll never hear an American accusing Israel’s leaders and doctors of being “murderers” because of abortion. That’s because it’s ISRAEL, a country that America holds up as the perfect state. Neither conservatives nor liberals will ever call out Israel for the heavily documented atrocities it routinely commits against Palestinian men, women and children. He seems to think that no person or country is above criticism, that only the Trinitarian God is perfect. But no, Jimmy is the one who is so misguided. He never seemed to understand that Israel is ISRAEL. The unspoken law of the land in America is that you don’t rag on Israel no matter what. It’s not kosher and that’s that. Thanks for saying what I am afraid to say at the moment. So much of this is driven by dispensational theology which puts Israel, no matter how many times they have violated their covenant with God, in this special situation of permitting no criticism against them. Misguided theology indeed drives so much of it. No question about it! Unfortunately, it’s easy to attack those who criticize Israel as being anti-Semitic. And, let’s be honest, Israel’s neighbors in the Middle East haven’t done much to endear themselves to the pro-Israel lobby, creating a very polarizing situation with past calls for the elimination of the Israeli state. Israel is not perfect; no state is. It is, comparatively speaking, far more democratic than anything else in the Middle East. But it has its problems and has made plenty of missteps. The difficulty in weeding out those who legitimately critique Israeli policy, both internal and external, from those who lash out at Israel because it is a Jewish state have likely enabled the country to skate on some issues other countries would have been called to account for. Israeli leaders have likely used this to their advantage. I tend to give Israel leeway given their situation: surrounded by nations who are or have in the not-too-distant past stated publicly their desire to wipe Israel from the map; subject to far more terrorism that we in the US could ever imagine; and having had to enduring four wars involving neighboring states since inception in 1948. I wouldn’t call Israel a “perfect” state, but then again, I don’t classify myself as a Conservative. I would say that the Israelis are in an unusual and difficult position. But that shouldn’t give them a pass on their mistakes.